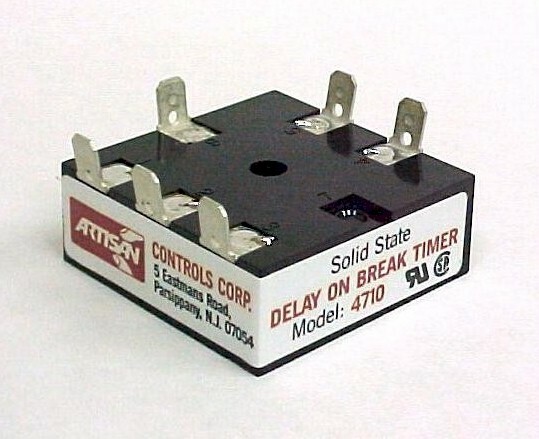 The model 4710 is an all solid state timer that offers delay-on-break operation. It controls DC loads to 1 ampere and AC load to 10 amperes. Closure of an initiate switch energizes the load circuit. Opening the initiate switch starts a preset timing period. The load circuit remains energized until the timing period has elapsed, then de-energizes. If the initial switch is reclosed before the timing period has been completed, the timing cycle will reset and the load circuit will remain energized. The model 4710 is available in both DC and AC operating voltages. Frequency 50 / 60 Hz for AC inputs. Output -A & -C models rated for 20 milliamperes to 1 ampere inductive. -B & -D models (AC only) rated for 50 milliamperes to 5 amperes inductive, 10 amperes with external heatsinking.